London's biggest piece of public art and shopping centre, 17,320 beds for athletes, an environmental energy centre and an international press hub: just a handful of the things in addition to the stunning venues that fill the London 2012 Olympic Park. "An architectural, environmental and logistical achievement"
Built on the site of a deprived, desolate, polluted and neglected chunk of east London, the Olympic Park will transform Stratford and leave a lasting legacy for many years to come. Time Out has described the Olympic Park as an "architectural, environmental and logistical achievement" - and who are we to argue? Completed well ahead of schedule and in keeping with strong aspirations of sustainability and legacy, the Olympic Park should add to the long list of what makes people proud to be British. Permanent venues dotted around the River Lea and its numerous canals and waterways include the spectacular Olympic Stadium, the state-of-the-art Velodrome and Aquatics Centre, the multi-purpose Paralympic hub Eton Manor and the versatile Handball Arena (aka the Copper Box). Impermanent structures include the Basketball Arena, Hockey Centre and Water Polo Arena. Meanwhile, the on-site Olympic Village will give all athletes the opportunity to walk to their own events, while everything will be connected to central London by the new Javelin shuttle service, carrying people between St Pancras and the newly developed Stratford City (with its Westfield shopping centre) in less than seven minutes. The legacy of the Olympic Park is quite substantial: it will be the site of the largest urban parks created in Europe for more than 150 years; a new university will be founded; the Stadium is expected be taken over by West Ham United FC; the permanent sporting arenas - such as the VeloPark and Aquatics centre - will be used for the public and competitions; the Olympic Village will be converted into 3,600 apartments. Royal Mail has given the postcode E20 to the Olympic Park - previously reserved for the fictional suburb of Walford in the TV soap EastEnders. For full details of all the Olympic and Paralympic sports venues in the Olympic Park please visit our Olympic Park Venues section. The Olympic Park's "something extra"
Presiding over the Olympic Park will be the Anish Kapoor-designed ArcelorMittal Orbit observation tower, which Mayor Boris Johnson described as that "something extra" needed to "distinguish the east London skyline" and "arouse the curiosity and wonder of Londoners and visitors". The 115m-high steel sculpture resembles a "continuously looping lattice" (The Independent) and will be the largest example of public art in the UK when completed by May 2012. The project is expected to cost around £20m, with most of the funding coming from the involvement of Britain's richest man, the Indian-born steel tycoon Lakshmi Mittal, chairman of the ArcelorMittal steel company. Painted red and located between the Olympic Stadium and the Aquatics Centre, the Orbit promises to be "an icon to match the Eiffel Tower" according to Boris - which is perhaps a bit antagonistic towards the French capital city of Paris, which famously lost the 2012 Olympic bid to London. Co-designed by Cecil Balmond, Kapoor's Orbit will offer two-storey dining and a viewing gallery - accessible by a spiralling staircase or a lift - over the whole of the Olympic Park and beyond. The sculpture is a permanent structure and after the Games it will be part of the lasting legacy of the area as it continues to attract visitors to east London. During London 2012, around 17,000 athletes and officials will have the luxury of being able to walk to their events from the vibrant Athletes' Village, which is located in the east of the Olympic Park with close access to Stratford International Station. There will be 3,300 apartments and a total of 17,320 beds in the Village, with each athlete having 16 squared metres of floor space. Every comfortable apartment will have a TV, wireless internet and access to a communal square or courtyard. The views over the Olympic Park have been dubbed "inspirational" while every venue in the Park is less than a 20 minute walk away. The Village includes shops, restaurants and medical, media and leisure facilities, while a dining hall will cater for 5,500 athletes at a time. Athletes can meet with friends and family in a special 'Village Plaza' and the nearby high-speed Javelin shuttle service can whisk the athletes into central London in just seven minutes. After the Games, the Athletes' Village will be transformed into 2,800 new homes - 1,379 of which will be affordable homes - as London 2012 lives up to its promise of a lasting legacy. New parks, transport links and community facilities (including a new educational campus, Chobham Academy, with 1,800 places for students aged 3-19) will also be opened. The IBC/MPC will be the home of around 20,000 broadcasters, photographers and journalists during the Olympics and Paralympics, bringing the Games to an estimated four billion people worldwide. Located in the north-west corner of the Olympic Park beside the Hockey facilities, the IBC/MPC will be a 24-hour media hub complete with a catering village serving 50,000 meals per day and a High Street-style shopping area - complete with banks, travel agents, newsagents and a post office - which links the two zones together. Completed in July 2011, the innovatively designed four-storey MPC features state-of-the-art utilities and will be taken on as office space following the Games. The Press Centre is doing its part for the environment too: its "brown roof" is made out of woods and seeds recycled from the developing parkland habitat around it. As proof of London 2012's commitment to use renewable and energy-efficient technology, a state-of-the-art Energy Centre will provide power, heating and cooling across the whole Olympic Park for the entire duration of the Games - and beyond. Located in the west of the Park below the Handball Arena, the innovative Energy Centre has a biomass boiled that uses woodchip as fuel to generate heat, and a natural gas powered Combined Cooling, Heat and Power plant (CCHP). The environmental and economic benefits include a huge reduction of carbon emissions - while the design of the Centre is both flexible and sustainable to allow it to be adapted as technology progresses. After the Games, the Centre will continue to support the permanent Olympic venues as well as the new buildings and communities that will develop after 2012. A second Energy Centre has been built in the Stratford City development to provide power, heat and cooling for the on-going project, set for completion in 2020. On the back of the London 2012 Games, the largest urban shopping centre in Europe is opening in September 2011 on the doorstep of the Olympic Park. Work on Stratford City started in early 2007 with phase one set to be complete in time for the Olympic Games and the entire project due to be finished by 2020. The new Westfield Shopping Centre at Stratford City claims to be "inspired by East London's creative spirit" and boasts unrivalled transport connectivity following the opening of Stratford International and the improved Stratford Regional Overground, Underground and DLR lines. Like in its older counterpart in White City, the Westfield Stratford City will have as its backbone the triple beacons of John Lewis, Waitrose and Marks & Spencer. Spread over a staggering 1.9m square feet, there will also be a 14-screen Vue cinema, a 267-room Premier Inn hotel, another hotel with 350 rooms, office space, almost 5,000 new homes, and 300 stores "from High Street to boutique, established to contemporary". 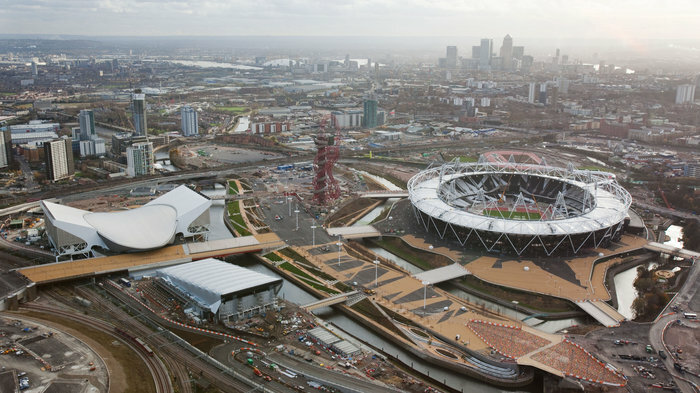 Find out how the London 2012 Olympic Park is progressing with a visit to the View Tube overlooking the Stratford site. A short walk from Pudding Mill Lane DLR, the View Tube is a social enterprise and community venue located on the Greenway, a public walking and cycling route overlooking the Olympic Park from where you can see the new venues and parklands for yourself. Made from luminous green recycled shipping containers, the View Tube provides exhibition opportunities for artists together with a classroom and The Container Café. An excellent second-floor viewing room affords panoramas over the Olympic Stadium, the state-of-the-art Aquatics Centre, with its neighbouring Water Polo Arena, and the towering ArcelorMittal Orbit sculpture, made from a lattice of red steel. As well as a shop selling official London 2012 merchandise and souvenirs, there's an excellent sheltered walkway with maps, commentary, pictures and information plastered across the wall. The outside garden space boasts many interesting artworks, chairs and tables, while another raised viewing platform affords views back over towards the City, with the Gherkin and the new Shard skyscrapers both prominent on the London skyline. Follow the Greenway for a walk through the Olympic Park, before picking up the riverside path to Hackney Wick Overground. The many paths are all clearly signed and there are many interesting walks to take your pick from - and if you fancy an audio commentary, then don't forget to download a podcast narrated by the world recording-holding British triple jumper Jonathan Edwards on the London 2012 website. For more information please visit www.theviewtube.co.uk. The Greenway is a flat, almost continuous and straight traffic-free walking and cycling route that carves through East London and the Olympic Park at high level, overlooking houses, gardens, rivers and the developing site for the London 2012 Games. The clearly marked path (follow the blue signs) runs 4.4 miles (7.1 km) from Wick Lane near Hackney Wick Overground in Bow through the Olympic Park to Royal Docks Road in Beckton, taking in four waterways, the View Tube overlooking the Olympic Park, Abbey Mills Pumping Station, East London cemetery and Beckton Alps. A broad gravel track has been constructed on top of the Northern Outfall Sewer Embankment, which carries effluent from north of the Thames to the mammoth sewage disposal works at Beckton. But don't let this put you off - there are no nasty whiffs en route, while the surroundings can, at times, be really quite pleasant and a haven for wildlife, with the track lined with grass and shrubs. What's more, the point where the Greenway runs above the former Marshgate Lane in Hackney Wick is the closest the public can view the spectacular Olympic Stadium - and a stop off at the View Tube and cafe complex which overlooks the Olympic Park explains all you need to know about London 2012. For more information and to download a map please visit www.walklondon.org.uk. From cheap budget hotels to luxury 5 star hotels see our discounts for hotels, including Radisson Blu Edwardian Mercer Street from 70% off.